Have you ever read Moomin books of Finnish novelist Tove Jansson? 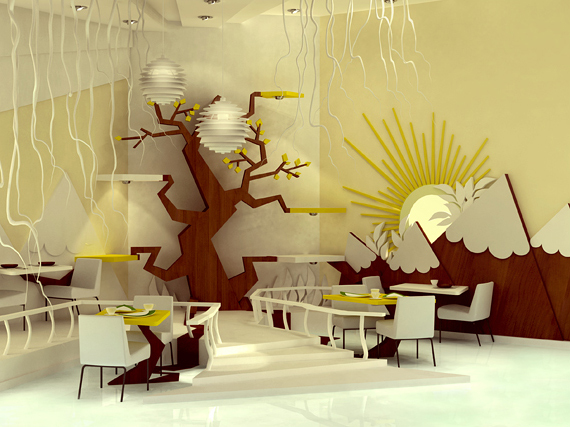 If yes you will love this bright design for family entertainment center created by designer Maria Yasko from Russia. We’ve already featured works of this designer – Interwined Shelves – and today want to continue. Interiors of children’s play hall, cafeteria and recreation were designed to recreate lanscapes from these books. Even colors in decoration will remind you about this fairytale. And of course everything was made to give your child pleasure and joy while visiting such center. The interior-as-movie-set… or children’s book. Wonderful thinkers and designers. awesome, all designs are really stunning, very beautiful. and thank u for sharing…..
Wow, love these ideas! How great would this be in a kids room! Thanks for sharing!!! Could somebody tell me what is the material used to construct this?? Any one know where can I find this book?? The one with the comet thing is so fantastic! I would love to live there! 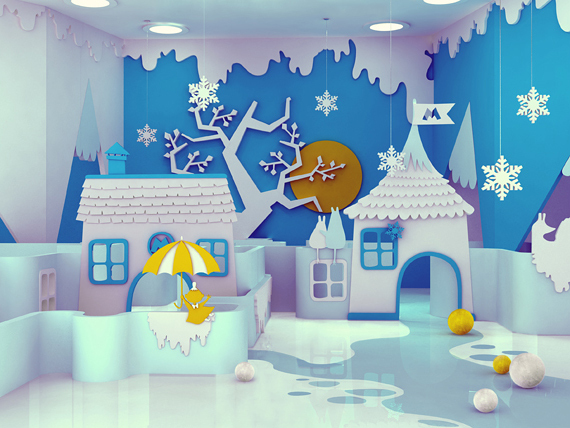 Someday when I’m a parent, I would love to make a playroom based on one of these designs. So awesome. I’ve actually never read any Moomin books, but I LOVE these designs. MUCH prettier than the usual Primary-Color scheme used for kids (I hated primary colors even when I was very small), and the soft tones manage to be both relaxing and fun! Awesome! Of course I’ve read the Moomin books! What amazing and very inspiring designs! Very innovative, the bright colors look magical and appealing to the eye. In such interior you would feel like you’re a leading character in a fairy tale.